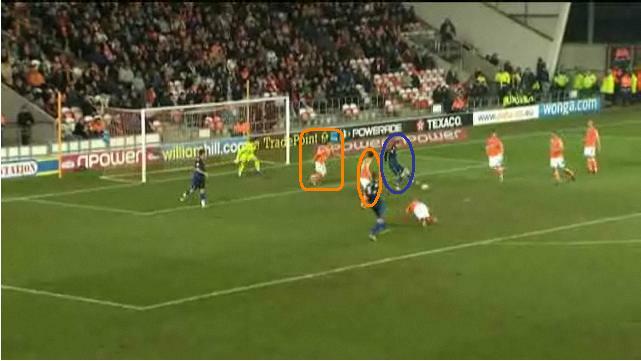 Last week the goal conceded to Cardiff was scrutinised as Blackpool made a succession of errors to let Joe Mason score the opening goal. This week the focus turns to the goal that Erik Huseklepp scored to give Portsmouth the lead at Bloomfield Road. 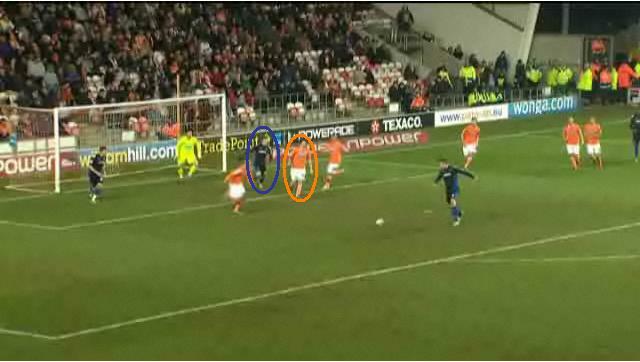 In this analysis the two facets being focused on are the excellent movement of Huseklepp and the defending from Blackpool. 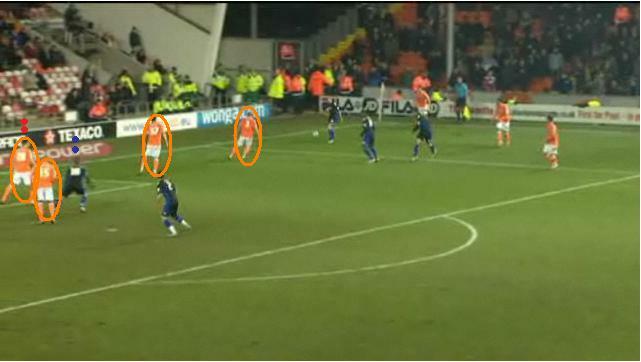 To preface the analysis Ian Holloway argued vehemently that the ball should never have been at Blackpool’s end of the pitch due to a poor refereeing decision. Here, however, that element will be ignored. The goal was scored and let’s focus on exactly why. Like Cardiff last week the Blackpool defence were given at least two warnings that they never dealt with in the run up to conceding. Firstly, from the throw in, Chris Basham had a challenge that had he won, would have snuffed out the attack. Secondly, after Matt Gilks made his save Blackpool could have reacted quicker to the loose ball to stop Portsmouth regaining possession in the Blackpool box. However, the reaction from Craig Cathcart after the goal was scored suggests he was well aware of his role in the goal. Before going in to detail here it’s critical to note that Cathcart had a fine game and defended most of his situations well including a Bobby Moore style stop to thwart a possible goal scoring opportunity. However, as the goal events were unfolding there is enough to question both Cathcart’s positional awareness, concentration and decision making. 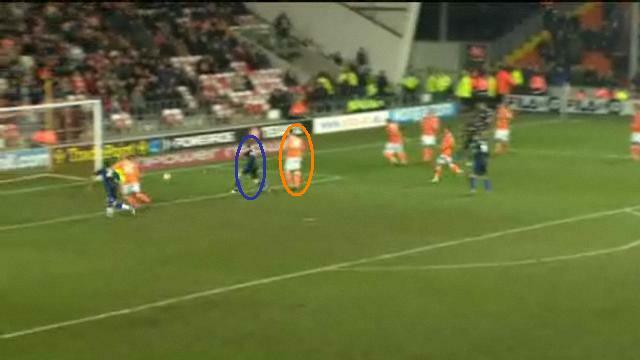 The screen shot below shows the position of the Blackpool back four prior to the shot coming in which Matt Gilks saves. You can see how all four defenders hold a decent position. Cathcart (two red dots above his head) has Huseklepp (two blue dots) in his sights. Cathcart initially goes with Huseklepp’s first run, anticipating that he may pick the ball up. However, Cathcart watches the ball as the shot comes in whilst Huseklepp shuffles his run and ghosts in behind Cathcart. You can see below how Cathcart is unaware of where Huseklepp has gone. This was the warning for Cathcart. Huseklepp will keep moving and darting around to fool him. Cathcart has decisions to make. Stick to the man and risk being pulled out of position, keep his position or react to the lose ball to snuff out the danger. The picture below shows the situation after the shot has been saved. As Márkó Futács lines up his shot, Cathcart is aware of that fact but not that Huseklepp is behind him. Cathcart is dealing with the matter in hand, which is all he must feel he can do. However, he must also have a keen appreciation of where Huseklepp has gone. What follows suggests that he is trying to deal with the matter at hand and has left Huseklepp alone either through a mistake or through passing on marking to a team mate, Barry Ferguson. Ferguson does drop in to cover as Cathcart goes out and this is when three things conspire against Blackpool. Fortune, in that the scuffed shot finds Huseklepp, but also first class movement from the Norweigan to get in-between Ferguson and Cathcart allied to his reaction to the poor shot. You can see below how Cathcart is left stranded, Ferguson has dropped to cover, but Huseklepp has ghosted in to a great position to seize on the chance. Ferguson cannot react quick enough to block the shot. Barry Ferguson is highlighted in the tangerine box as he drops in behind Cathcart & Huseklepp. In all fairness, Huseklepp made this goal through excellent box play. Constantly moving, making three runs in total, becoming very hard to track. However, Blackpool will know that the situation was solvable and Cathcart will once again add this to his experience in the hope of becoming a top quality centre back.